Is your week booked? Check our other listing, 152737 with private (heated when needed) pool. This beautiful home is located on a cul-de-sac -- just a few minutes walk from the private community beach, swimming pool, tennis courts, and playground. Kids and adults alike will enjoy the ground-floor game room which has a snack kitchen, small pool table, and is adjacent to the outdoor living space with gas grill and outdoor dining area and deck overlooking the dunes. The ground-floor also features a bedroom and bath. The main floor is the main gathering area. The spacious dining table is ideal for family meals and games; and the comfortable living area is adjacent to the screened porch and open kitchen. Two bedrooms with queen beds and a full bath complete this floor. The master suite is on the third floor -- with access to the upstairs screened porch and a luxurious bath with separate tub and shower. A bunk room is adjacent to the second bath on this level. A study with a porta crib provides a quiet getaway for reading, games, or sleeping! Pets/animals of any kind are Not allowed, And No smoking, inside or out, please. Amenities include a telephone, air-conditioning, satellite TV, a VCR, stereo, linens, a washer, dryer, and a gas (barbecue) grill. The full kitchen includes a microwave, dishwasher, refrigerator, ice maker, and cooking utensils. Activities (on site or nearby) include hiking, biking, golfing, tennis, fishing, wildlife viewing, shopping, sightseeing, swimming, boating, sailing, water-skiing, surfing, windsurfing, parasailing, jet-skiing, and shelling. Also close by are restaurants and museums. There's a lot to do on Dauphin Island! Visit the Dauphin Island SeaLab and Estuarium, Fort Gaines (a historic Civil War fort), and beautiful nearby Bellingrath Gardens. The whole island is a bird sanctuary. And especially during the spring and fall, you can see many different types of birds on their migratory trips. You can charter boats for both fishing and sightseeing. Enjoy taking a boat ride to see the historic Sand Island Lighthouse. You can also take a car ferry ride across Mobile Bay to visit the Gulf Shores area -- with its water parks and outlet malls. There are several seafood restaurants on the island, as well as a chocolate shop, bakery, and an ice cream shop! You can ride bikes on the bike trails which cover most of the island! Our home is just a short drive to Mobile, Alabama, where you can visit many area museums such as the Exploreum Children's Museum or our Mobile Museum of Art. Mobile has a wonderful family-oriented Mardi Gras celebration. Our family built our Dauphin Island getaway in 2002, as a place to escape, relax, and build family memories with our own family of 3 boys. We live in nearby Mobile, Alabama and are custom homebuilders, so if you decide you need your own Dauphin Island home, we can help with that, too! 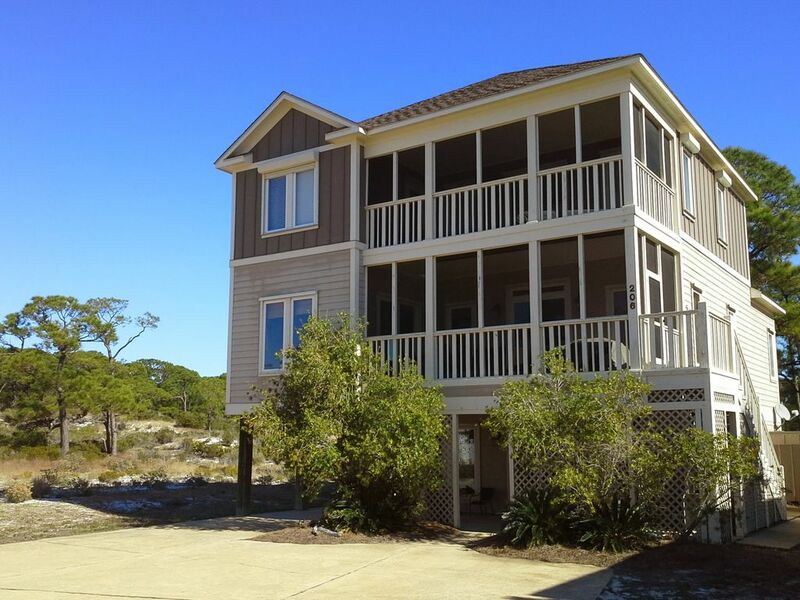 We love the East End of Dauphin Island for its quiet, residential feel. Located near the end of a cul-de-sac, we love the beautiful dune views and quiet street. Our neighborhood has a private community pool, private neighborhood beach access, and a tennis court. You can easily take long walks on the beach, down to the Audubon Bird Sanctuary, and back to the neighborhood via the bike/walking trail. Because this is our personal family home, it is equipped how we like it to be! You'll find lots of coffee cups (Julie prefers tea, however), dishes, and cooking utensils. The kids will enjoy the big bucket of sand toys, scooters, and bikes, which we are happy to share with you though we can't 'guarantee' them. Our home was designed to provide a comfortable main living area for gathering with the whole family, yet also provide several different 'getaway' spots such as the back deck, hammock, or 3rd floor porches, when you just need a little quiet time! We are a short walk down a quiet neighborhood street to the community waterfront area....just a few hundred feet. Please bring your own beach towels. If you are going to use the porta-crib please bring your own mattress pad/sheets for it. We provide sheets and bath towels. We provide bath towels. Please bring your own towels for the beach and pool. Our living room features a comfy sofa and loveseat, extra seating, an ottoman for relaxing, and a television with Satellite TV. French door refridgerator with bottom freezer drawer on main floor. Traditional fridge on ground floor is great for overflow and drinks. Electric Maytag Gemini Range has double ovens (one small, one large) . Great for fixing meals for a crowd! We usually have nice variety of spices available to share. This collection tends to evolve as our guests contribute, so it's ever-changing! We have plenty of dishes for your your family! And we have LOTS of coffee cups, because we know you'll love to visit over a cup of coffee or tea! Our kitchen is spacious and great for groups! The raised bar lets guests visit while the cooks have plenty of room to create delicious meals! The dining room table is wonderful for dinner or games! Easily seats 10. The table on the adjacent screen porch seats 4 more, or you can let the kids sit at the bar! There is one television on the ground floor and one on the main floor. Our home features DISH Network satellite. We have a nice selections of paperbacks for you to enjoy when you visit. We also have a nice selection of childrens' books. We have a nice selection of family games! We have a mini pool table on the ground floor. We have two screened porches, one on the main floor and one on the third floor. Our neighborhood has a tennis court. Please do not ride bikes on the tennis court. Downstairs level is a small 3.5' rise with no stairs to climb. This area has a bedroom, bath, and living area with snack kitchen. Neighborhood pool is a short walk from the house! This was our first experience to this beach. I loved how the walk was close from the home. It was private and serene. It was just what our family needed. The home itself was by far way behind our expectations. The kitchen was fully stocked with supplies and the whole house was bigger than it appears in photos. Owners were very accommodating and pleasant to work with. We so enjoyed our visit!! Great Home! Best equipped home we have ever stayed at by FAR! Bikes, beach carts, beach toys, books, grill(looked brand new), screened in porch, 2 minute walk to beach with pool on the way. We had two very good cooks, and they both have never seen a rental kitchen stocked so well. We felt at home. Community was extremely welcoming, safe and friendly. Hope to come again. We had one question and Julie was quick, courteous, patient and kind. Only regret was that we did not meet the owners to thank them in person. The house is well equipped and everything needed to cook gourmet meals was there. 2 refrigerators gave lots of room. We enjoyed the pool table and volleyball net. Those extras plus bikes was an added bonus. Can't beat Harmony for a week!! Great place to stay, fully furnished with all essentials, close to the beach for easy access and more than enough space for the whole family. We truly enjoyed our stay and wish it could have been longer!! Can't go wrong here! Thanks, Brian, So glad your family enjoyed our home! We love it too! Looking forward to having you visit again! The island home was just as described... a perfect place for a large family. Lots of beach and rainy day equipment - bikes were in great condition. Such a great little get-away island. This was our fourth visit to Dauphin Island and our second staying in this lovely home! It's so well equipped and easily accommodated two families with private space for everyone (11 guests total). The kids really enjoyed playing on the sand dune adjacent to the house as well as the tennis courts. The bikes were put to great use with daily trips to Ship & Shore by the older kids. Unfortunately, it was a very cool week so beach time and pool time was limited. Regardless, it was a wonderful spring break to this family friendly island and so glad this home was available for our stay. Visit the Estuarium, Fort Gaines (a historic civil war fort), and beautiful Bellingrath Gardens, The whole island is a bird sanctuary, and especially during the Spring and Fall you can see many different birds on their migratory trips, Charter boats for both fishing and sightseeing, see historic Sand Island Lighthouse, You can also take a car ferry ride across Mobile Bay to visit the Gulf Shores area, water parks, outlet malls, etc, There are several seafood restaurants nearby, as well as a bakery and ice cream shop! You can ride bikes on the bike trails which cover most of the island! In Mobile, Alabama you can visit area museums such as the Exploreum Children's Museum or our brand new Mobile Museum of Art, Enjoy a Bay Bears baseball game, or even Mardi Gras!